In 20-25% of cases handled by Children’s Advocacy Centers (CACs), youth or children under age 18 have acted out against another child.1 Research also shows that a similar proportion (23.2%) of sexual assaults are committed by juveniles.2 Therefore, a significant proportion of child sexual abuse cases encountered by CACs are likely to be committed by another child. To achieve their goals of healing, justice, and prevention, CACs have an interest in addressing this issue and serving children and youth with problematic sexual behaviors (PSBs), their victims, and families. The process of identifying and responding to PSBs among youth and children is often fragmented and inconsistent across the country. CACs are leaders in supporting families impacted by child abuse through coordinated multidisciplinary response and care. This uniquely qualifies CACs to coordinate effective interventions for this population. 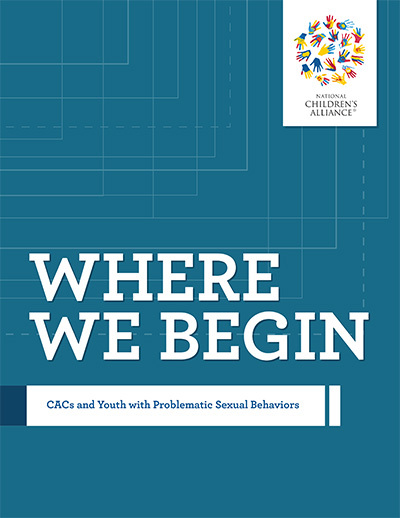 Below is a set of all-new resources for CACs to educate leaders, staff, partners, and caregivers on this crucial issue and to help improve the CAC response to problematic sexual behaviors. Additional guidelines and considerations to discuss and employ with your team as you expand and improve services to address youth and children with problematic sexual behaviors. View a recording of our webinar hosted by experts on addressing problematic sexual behaviors in youth and children in trauma treatment, and the connections between the TF-CBT and PSB-CBT treatment modalities. The three fact sheets below are developed for use by CACs to educate themselves, their partners, caregivers, and communities on addressing youth and children with PSBs. While all NCA member CACs were sent a number of copies of each fact sheet at the time they were launched, CACs and partner organizations may download these documents free at any time to print additional copies for distribution. This fact sheet is intended for CAC leaders and staff, with guidance on building the response to problematic sexual behaviors, the key role CACs play in addressing this issue, and building community support for the CAC response. 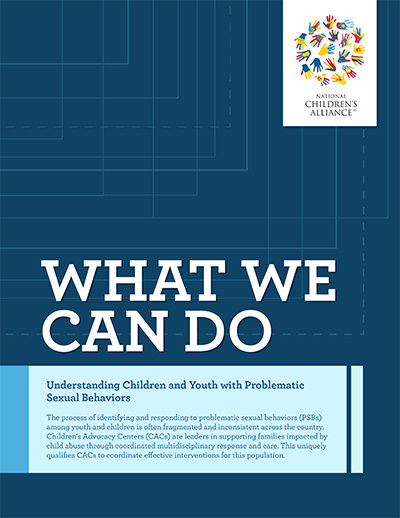 This fact sheet is an overview of problematic sexual behaviors in youth and children, and includes basic information on the continuum of childhood sexual behaviors, criteria for problematic sexual behaviors, the role of language and science in informing the response, and next steps for communities. It is appropriate for community partners, multidisciplinary team members, and general education on the issue for CAC staff and community members. This fact sheet is intended for caregivers of children and youth with problematic sexual behaviors, with guidance on the how caregivers can help their children and answers to pressing questions caregivers and family members may have. 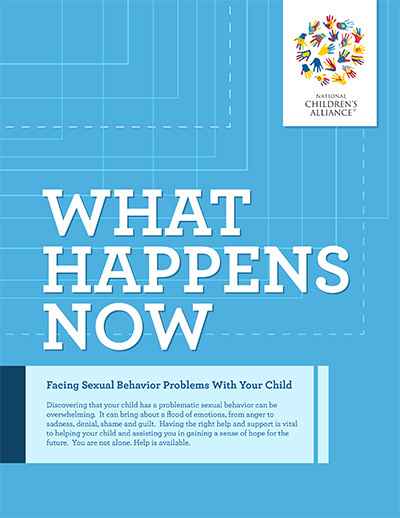 NCA partnered with the National Center on the Sexual Behavior of Youth to produce a free, two-hour video training series intended for CACs on addressing youth and children with sexual behavior problems. Below is a trailer for the series and a link to access the training. To access the training series, click the button below. You will be redirected to the Midwest Regional CAC website where the training is hosted. From that page, click the purple “Register” button, and follow instructions to begin. View a recording of our February 2017 webinar hosted by experts on addressing problematic sexual behaviors in youth and children. Thanks to the National Center on the Sexual Behavior of Youth, NCA’s Youth with Problematic Sexual Behaviors Collaborative Work Group, and Midwest Regional Children’s Advocacy Center for their expertise, assistance, and hard work in creating these resources. National Children’s Alliance 2015 statistical data submitted by Children’s Advocacy Center members.